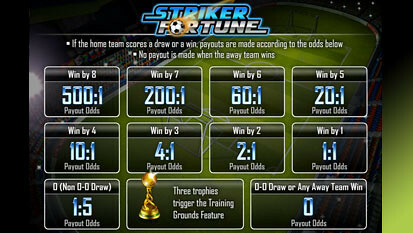 Striker Fortune Slots is a fantastic 5 reel video game with 99 ways to make a winning combination appear on the screen. The game features fantastic graphics, bonus game and other interesting options. The game was released in June, 2010, but by now it already has a lot of fans all over the world. The slots can be played both by installing a casino program on your computer and by trying the no download version available on the web. The game is based on a world soccer championship theme, so the fans of this world’s most popular kind of sports will lose their sleep after trying Striker Fortune Slots. You are suggested to try and win a championship by scoring goal and winning serious sums of coins like the top jackpot of $50,000. 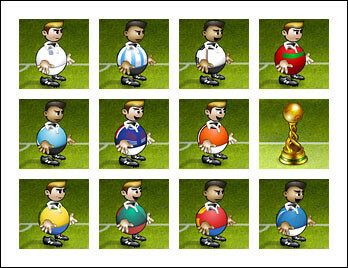 The game suggests you to win the world trophy by playing for one of 32 strongest soccer teams of the world. Sometimes the teams make a lucky strike and an amazing Bonus Game is triggered, so that you could win even bigger sums on the way to the top goal. Fantastic game design and different looks of teams playing make the game incredibly interesting and bright. You will be pleased to see that all symbols are animated in this game to make it even more lively and eye-catching. Featured sounds will give you a nice feeling of staying at a real football field. To score goals and win ever more coins you can make winning combinations with the players of 32 best soccer teams of the world. To name just a few of them, they suggest to play for Brazil, France, Argentine, England, Cameroon, Uruguay, The USA, Spain, Germany, Netherlands and many more. The game suggests you an incredible range of bets varying between $0.25 and $100. The total number of bets is 40, so you will really enjoy the game by trying your luck with different bet sizes. Bot high-rollers and careful players will like Striker Fortune as it is balanced so well, that all bets can equally hit great combinations. 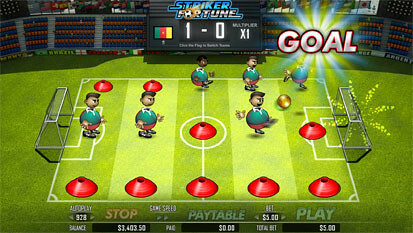 The highest jackpot is 500 coins or $50,000 for striking 8 goals. The second jackpot is 200 coins or $20,000 for striking 7 goals. The third highest jackpot is 60 coins or $6,000 for striking 6 goals. In Striker Fortune Slots you are suggested to win some extra money even if you do not get any winning combination on the reels. It is possible in case of scoring three World Trophy scatter symbols on the screen. These symbols appear on the reels 2, 3 and 4, and trigger a bonus game for you to train the team and win some extra money. Bonus Game. If 3 scatter symbols of World Trophy appear on the reels the bonus game of Training Grounds is activated and played on the second screen. Every time you play this feature your players are placed randomly on the football field and can score a goal. All your wins during the bonus game are multiplied by 1, 2, 3 or 4. The multiplier number is selected randomly, but if you are lucky to get the biggest one your wins can reach $500,000 with the maximal bet of $100, and $500 with the minimum of $0.25 staked. 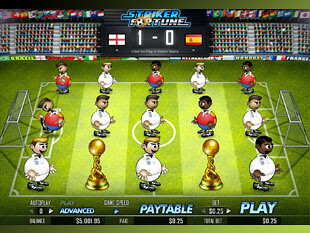 Striker Fortune slot machine is a fantastic game of chance for real soccer fans. In the game you will get involved into the incredible atmosphere of world trophy to score great prizes, win good jackpots and try a great bonus game. Fantastic graphic design and fascinating animations will make the process of playing really interesting, so you definitely will not get bored of the game. All you need to make sure of it is to try it.